Made with 15 Red Roses,Scarlet blaze of love and passion shared made ever more romantic by surprising your darling with this elegant arrangement of dark red roses in a glass vase will keep the flames of desire burning throughout time. With flowers, you can never go wrong; this may seem like a bold statement, yet fragrant little blossoms can swing anyone in a bad mood to a good one, can lighten up someone's day and bring a calming sense of happiness. Which is the simple reason that bunches of roses, sheaves of geraniums and baskets of lilies and daisies are seen at anniversaries, birthdays, commemorative days and even when someone is in hospital or feeling a tad under the weather. 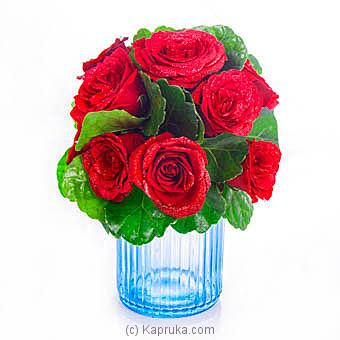 Kapruka has been a life saver for over a decade now in the sphere of gift giving and celebrating with its wide choice of floral tributes and arrangements. If you want to say thank you, I love you or bow down and apologise, sending flowers through Kapruka is a great strategy worth exploring. Their e-commerce site has all the colours, styles, sizes and the best online price for your need and purse. Usually, flower delivery on the same day should be a surprise and given your own schedule to time and place the delivery can be difficult, which is how the online flower delivery option of Kapruka comes in to play a pivotal role. The online flower shop of Kapruka to say the least is enticing; the online florist has surpassed himself and presents some absolute eye candy every day and all these cheerful designs have the most sensational names. Colombo flower delivery comes at no extra charge while deliveries to suburbs and other parts of Sri Lanka are charged a nominal rate. Once you place an online flower order it is a hassle and headache free process where you can rest assured that the flowers will reach the intended recipient by the specified time. The gentle and smooth petals, the soul soothing scent and the combination of comforting or exhilarating hues of the flowers are bound to make the recipient, your loved one feel truly blessed. No one would know that the sunny blossoms flourishing in their arms were actually found through an online shopping stint. Ladies enjoy buds and blooms the most, yet there is nothing stopping you from refreshing the day of a gentleman with a tasteful choice of blooms either. Shop online for all your floral needs, whatever the purpose, whoever the recipient may be and whenever you need them as Kapruka will take ownership of the freshness of the flowers as well as the promptness of the delivery. Copyright 2000-2019 Kapruka.com® Online Shopping for Sri Lankans around the world.